What does it mean to go through orientation with TransAm Trucking? TransAm Trucking hires all sorts of drivers – from experienced contractors and company drivers, to students straight out of truck driving school. The needs of our drivers depend greatly on the level of their experiences in the trucking industry. At the bare minimum, “orientation” is defined as “a program of introduction for newcomers to a college or other institution.” TransAm’s Training & Development team takes it a step further. Not only does our team help new drivers orient themselves within the TransAm family, they also help mentees become confident drivers so that they can be successful in the trucking industry. 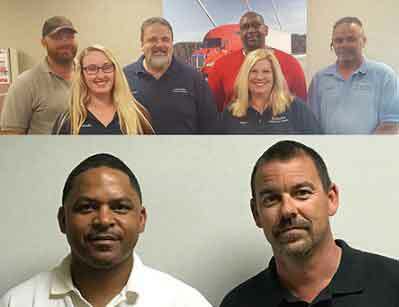 TransAm’s orientation is unique because our Training & Development team consists of former TransAm Trucking independent contractors and company drivers. Four of our team members even went through TransAm’s training program. Our mentee drivers are trained by people with firsthand knowledge of TransAm and the trucking industry. They believe in the program because it helped them become successful truck drivers. Now they are helping other newcomers succeed. For inexperienced mentee drivers, TransAm devotes the first days of orientation to training and reviewing over-the-road skills. The idea is to reduce stress through preparation. Starting a new career is a big undertaking. Getting on-the-job training, in a controlled environment, allows students to practice their skills before getting behind the wheel with their mentors. Mentees are encouraged to ask questions and take their time. It’s better to do something safely, instead of quickly. After the review sessions, mentees spend nearly two weeks with their mentors. Each mentor is either a current company driver or independent contractor with TransAm Trucking. However, these aren’t just any drivers pulled from the terminal yard. Becoming a mentor involves three steps. First is the application process where TransAm inspects the potential mentor’s driving record – paying attention to safety records and time management skills. If approved, the potential mentor then goes through a phone interview. The final step is face-to-face training classes. We certify each mentor before they get into a truck with a student. If a new driver is going to make a commitment to TransAm Trucking, we are going to make a commitment to them. This means offering a Training & Development team that knows what it means to be a truck driver. It means providing mentors we know will help our students succeed. Our goal is to make mentees as confident in their skills as possible before getting in their own trucks. Moreover, our training does not stop with orientation. Our Training & Development team is willing to work with drivers whenever they want to refresh a skill. Our team also sets up quarterly safety classes as an additional resource for company drivers, and those classes are also available to independent contractors at their option. Training does not stop at orientation. It’s an ongoing process.